Warren talks about what he remembers most about going to summer camp. Lindsay: So we're talking about camp today. Did you ever go to camp when you were a kid? Warren: I did. I usually went to Cub camp, you know like Boy Scouts. Lindsay: OK. Was it during the summer? Warren: Yes, it would always be in the summer. Lindsay: And was it for a week or a month? Warren: I can't recall, it probably was about a week. Lindsay: About a week. What did you do at Cub camp? Warren: We'd do different things. One thing I remember is archery. Warren: Yeah, like bows and arrows. So we would have a target and we would practice trying to hit the target and I was really bad at it. I remember always, it's quite difficult and I would hurt my arm with the bow. But then after we were trying to get the target I remember we did distance as well and I was actually pretty good at that. I figured out how to get a long shot away and I think, I might be lying, but I think I maybe got the longest shot than anyone else. Lindsay: Wow. Congratulations. 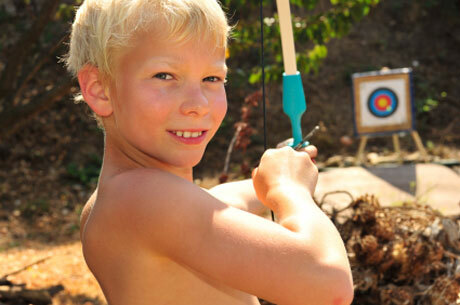 OK, besides archery were there other games you played or sports you did? Warren: Yeah, we would learn how to canoe and we'd swim and we'd go on hikes. We learned how to navigate through the forest with a compass. Lindsay: OK. Did you learn how to start fire without matches? Warren: We did, yeah. We'd use two sticks, rub them together and start a fire. Lindsay: Wow. What would you guys do at night? Would you play games or have campfires? Warren: Yes, we'd always have a campfire at night. We'd sing some songs, Kumbaya, and put on some skits and tell ghost stories but my favorite thing to do at the campfire was roast marshmallows. Warren: I'd spend hours trying to find the perfect stick to carve and roast marshmallows on. Sometimes we'd even make the chocolate smores for the marshmallows. Lindsay: Yummy. So that food was good, how was the other food? Warren: I don't have any memories of it being good so I don't think it was very good. We would eat together in a mess hall much like yourself and actually I remember getting really sick one time and my parents had to come and pick me up and I think I got a bit of food poisoning. Lindsay: Oh wow, from the food? Lindsay: In scout camp, wow. OK. Final question, so you were away from your family right? Lindsay: Was that hard or easy? Warren: It was easy. I remember feeling a little freer and more independent away from my parents, less rules, less regulations. Lindsay: You weren't homesick at all? Warren: No, I never did get homesick. Even when my parents came to pick me up that time when I was sick, I really didn't want to go home. Lindsay: It's too bad you got food poisoning. We would practice trying to hit the target and I was really bad at it. I'm terrible at darts. I can't even hit the target! My dad enjoys hunting and target shooting. We learned how to navigate through the forest with a compass. We had to navigate a difficult course through the mountains. They put on some skits at the church charity party. We put on a play for the school. I think I got a bit of food poisoning. I often eat from stalls, but I've never got food poisoning. Food poisoning is always a concern for me while traveling. There were less rules, less regulations. There are so many rules and regulations these days. The business community is campaigning for fewer regulations. It's now easier to through the woods with a GPS. The archer aimed for the . Students have to abide by the school rules and . We a musical for the tourists. Be careful what you eat out in the streets, or you might get .